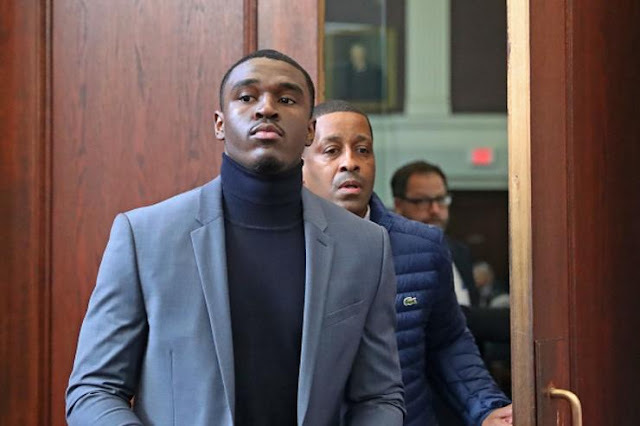 Jabari Bird has reportedly plead not guilty to two new charges related to the September, 2018 domestic violence incident that saw his removal from the team since the start of the season. Bird, who'd worked his way up from a two-way deal to a regular NBA contract, is accused of multiple, very serious charges stemming from an incident with a former romantic interest, who he is accused of threatening and choking. The Boston Celtics have been very cautious with the matter, stating their distaste for violence of any sort while holding Jabari out while he becomes the first person to work his way through the league's domestic violence policy, settled just months before Bird's situation forced an early test. Details of the process are somewhat opaque to outsiders, but require a panel hearing and legal verdict, with potential outcomes ranging from full reinstatement if found to be without merit, to, in Jabari's case, a more likely outcome of a voided contract and expulsion from the league, the harshest penalty reserved for cases similar to what has been alleged about Bird. The roster slot itself is not a crucial one, as it's typically reserved for players who rarely crack the rotation sans injuries higher up the food chain, but with Jabari's longtime friendship with Jaylen Brown (and support of his family, as Brown's mother is Bird's court-ordered monitor) coupled with the impact Jabari's salary may have on Boston's tax situation, is something to be monitored. For now, we're unlikely to see a resolution before the NBA Trade Deadline (February 7), as his next court date is not until February 13th, but should the league void his deal, the money would no longer count against the tax, and leave the door open to signing a buyout candidate or overseas player for playoff depth should the Celtics deem it worth going back into the tax by signing a player to that slot.